DIY garden décor ideas | WaterPlant - Turning your garden into a paradise. With all the amazing garden décor available from Water Plant, there are so many ways to decorate your garden. However, what about adding to your garden with a little DIY garden décor? 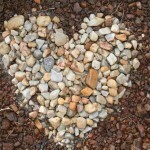 These garden décor ideas can be done using rocks and stones, so read on for some simple DIY ideas! Add some stepping stones to your garden by simply collecting a whole lot of stones and arranging them in all sorts of cute patterns. Stepping stones are a great form of garden décor which really adds some life and direction to your garden. You can then further brighten them up by painting the stones with bright colours. This is your chance to show off your artistic skills! Add a personal touch to your garden with DIY bird feeders, made from all sorts of materials such as plastic bottles, tin cans and even milk cartons! Bird feeders are a great form of garden décor, allowing you to enjoy bird life at its best. Garden benches are a popular and necessary part of garden décor, providing both a decorative and functional element to your garden. Even though there are all sorts of fabulous garden benches to choose from at Water Plant, you can also get creative by adding some of your own DIY garden benches, made from regular stones and held together by wire. Add some throw pillows and soon you will have yourself your very own DIY garden bench! Who knew that so much could be done with regular garden rocks and colourful paint? Add to your garden décor by using rocks to create cute little garden ornaments which can be placed all over the garden. For example, you could create your own garden caterpillar by using rocks as the caterpillar’s body, painting a face onto the rock in front. You could also create cute little garden markers which mark what you are planting. The colour will really add a touch of playfulness and personal touch to your garden. No matter how you choose to decorate your garden, combining DIY garden décor ideas with high quality garden décor from Water Plant will really have your garden looking interesting and visually appealing! Using these natural elements is a lot of fun and requires hardly any maintenance. So go ahead and show everyone how creative you are with your very own DIY garden décor. Also, don’t forget to have a look at our wide range of garden décor in order to help create your dream garden.